Slide 1: Reference: Glavin, T. 1998. 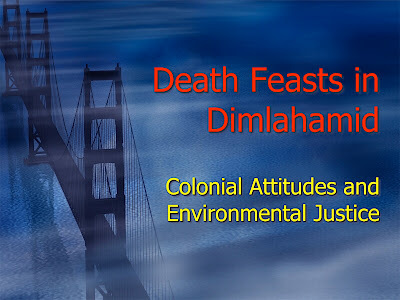 A death feast in Dimlahamid. New Star Books, Vancouver, British Columbia, Canada. This book presents a complex history of the relationships between Indigenous Peoples (First Nations) in the Canadian Province of British Columbia. 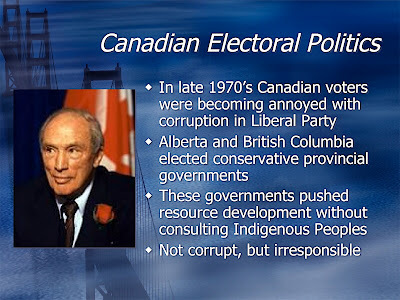 It is important to realize that BC was one of the last provinces to join Canada and that provinces in Canada have more power and are more independent than are states with the United States. Thus provinces try to establish their own policies with regard to First nations and that these may be in conflict with Federal policies. 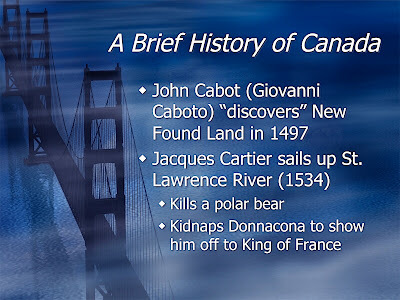 Slide 2: Canada has a history quite different than the United States. This is primarily because Canada did not break away from England, but remained under the control of Britain until Confederation in 1869 (after the US Civil War). This had some interesting implications in its interactions with the First Nations, with whom all negotiations were originally conducted by representatives of the English government, not the Canadian government. 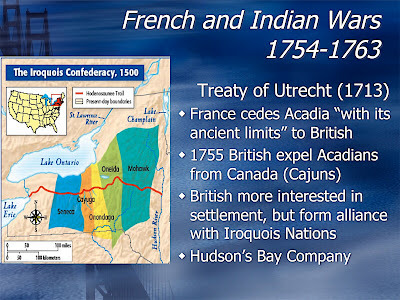 Many of these First Nations fought with the French during the French and Indian Wars and later with England during the American Revolution and the War of 1812. In consequence relationships were more congenial with many First Nations and there were none of the massacres and little open warfare. Canada did not have its own army and the British army was more interested in alliances with the First Nations than in conquest. 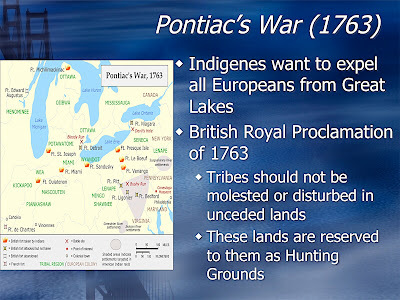 Slide 6: Pontiac’s War was significant because it represented the first attempt by Indigenous peoples to organize into a cohesive fighting force to oppose the westward expansion of both the US and Canada. They wanted Europeans out of the Great Lakes area. They did not go after the French, in fact it is difficult to any overt conflict between the French and any tribe. The French formed alliances and married into tribes. From a Kansas perspective it is interesting to see the fates of many of these tribes. The Shawnee, Lenape (Delaware), Kickapoo, Potawatomi, Ottawa, Wyandot, and Miami were all removed to west of the Mississippi and ended up living in Kansas (all have counties or rivers named after them in Eastern Kansas). Most were moved a second time into Oklahoma as Europeans moved into eastern Kansas. Slide 7: The American Revolution is often discussed as if it took place in a vacuum involving just the US and Britain. In fact, it took place in a complex economic and geographical landscape and had profound implications for Indigenous Americans. Slide 8: Aggression between the US and Britain (Canada) flared up again. One of the major causes was another alliance of tribes, this time organized by Tecumseh, a Shawnee leader. The goals was to prevent US expansion west of the Ohio border into a state named Indiana because it was supposed to represent where lands controlled by Indigenous peoples began. 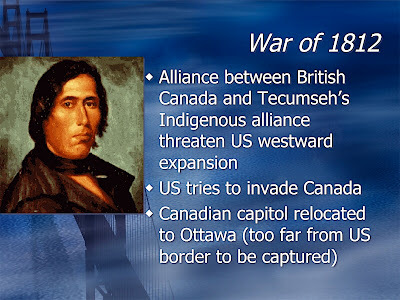 Combined British and Indigenous forces captured Detroit with joint operations run by General Isaac Brock and Tecumseh. Brock was killed during a failed attempt by Americans to invade through the Niagara corridor and Tecumseh was killed later at the Battle of Moraviantown near contemporary Windsor, Ontario. These two deaths effectively ended the resistance by tribes east of the Mississippi. 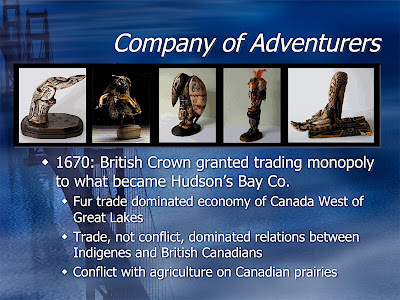 Slide 9: The Hudson’s Bay Company dominated trade in Canada for hundreds of years. Even today “The Bay” are the dominant department stores in many Canadian cities. 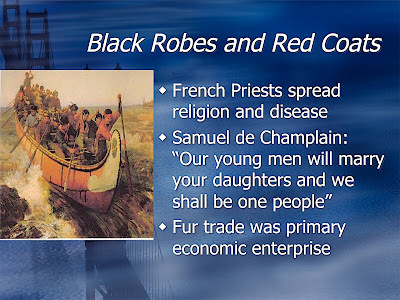 Much of Canada is not good for agriculture and the fur trade is still important in some areas. There is much less of an anti-fur attitude in this cold climate. 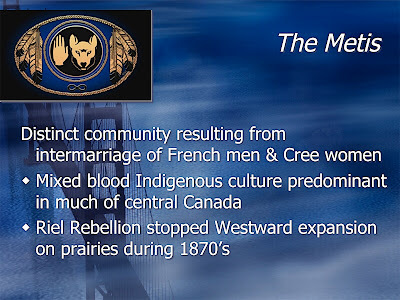 Slide 10: The Metis are still an important political and social group on the Prairies and are unique among Indigenous groups in that they are a hybrid culture. Slide 11: BC is an enigma. It is a province that is split between very conservative businessmen, farmers, and ranchers and very progressive academics, artists, and labor unions. Vancouver is the largest city and appears quite progressive, but it has an odd history of attacks on non-white labor, especially Asians, who today are a major economic force. Victoria is the provincial capitol because Vancouver Island was settled before much of the mainland and the island is still heavily controlled by mining and forestry interests. Slide 12: Most people in British Columbia live in Southwest corner of the Province around Vancouver and Victoria (provincial capitol). 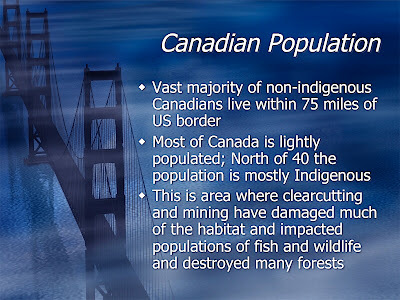 Much of the interior of BC has a very small European population and First Nations people dominate numerically. 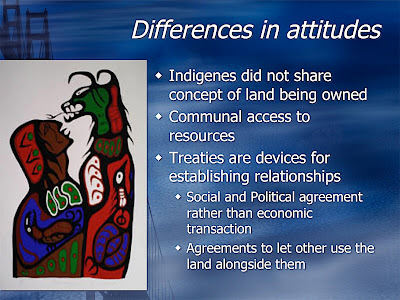 Slide 13: At the time of Confederation in 1869, Indigenous people outnumbered Europeans in BC, even though the BC government basically ignored the existence of the First Nations. This changed by the 1880’s. In 1881 the entire population of BC was around 50,000 of whom about 48% were First Nations, by 1911 it was up to 392,000. Today BC is less than 5% First Nations people. 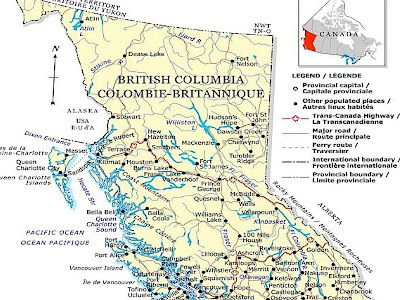 In 1871, with over 99% of its land without any treaty, BC joined the new Canada. Article 13 of the Terms of Union reads "The charge of the Indians, and the trusteeship and management of the lands reserved for their use and benefit shall be assumed by the Dominion Government....". As with the eastern colonies, no Indian Nation in BC was part of any discussion, negotiation or agreement regarding the new Union. From 1871 to 1923, Indians were not allowed to fish commercially. 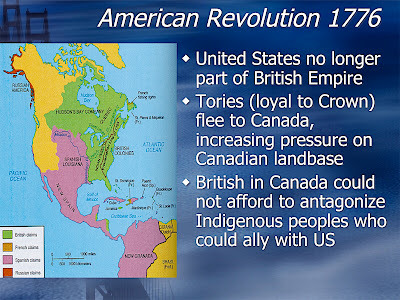 Slide 14: Fearing an American invasion, the British Parliament passed the British North America Act to unite the 5 eastern colonies to form the new nation Canada. No Indian Nation was invited for discussion or to obtain consent for the formation of a country upon its land. No Indian Nation was even informed of such events happening. 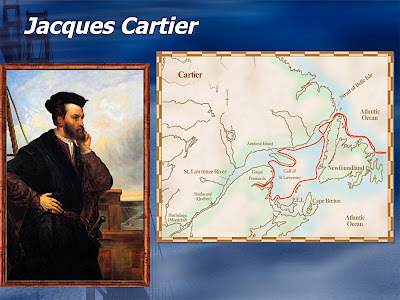 In order to expand from sea to sea, the new Canada sent out Indian Agents to make treaties with the various Indian Nations in other provinces, claiming they did so in the Queen's name. As a result, the treatied Nations thought their treaties were with the British Crown and continue to believe so today. 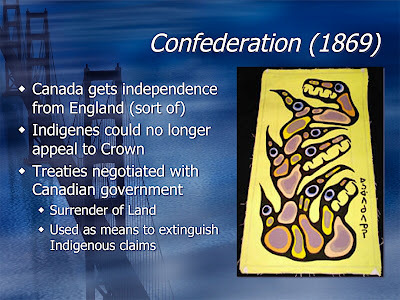 Canada committed a massive fraud but has consistently used such post-confederation Treaties Number 1-11 as evidence of having Title to the Indian lands. 1884 The government banned the native Potlatch (the major social, economic and political institution of the coastal people) to prevent them from organizing and exercising their self-governance (not repealed till 1951). 1886 The Dominion completed the transcontinental railway to BC. Nisga'a in the Upper Nass resisted surveyors & began organizing land claim. 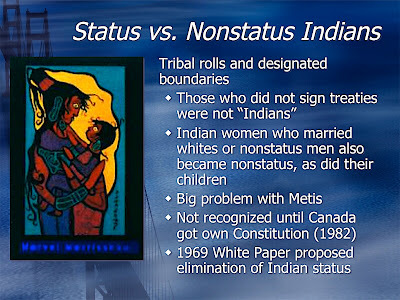 Slide 16: This was part of a very troubling political effort to assimilate Indigenous peoples and remove any special status. This started with an effort to remove Aboriginal status from Indian women who married non-Indian men. Their children were also no longer considered Indians. This was not changed until the 1980’s. 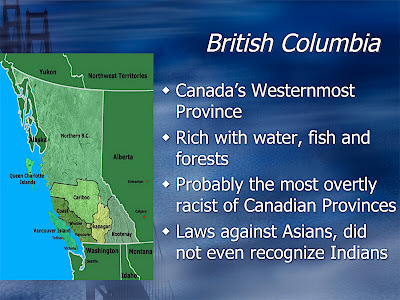 In BC it was even more noxious, with any Indian who went to university of lived off reservation losing their status. 1916 McKenna-McBride Royal Commission report recommended changing and redistributing reserve lands, enlarging some but also advising that much valuable land be removed. 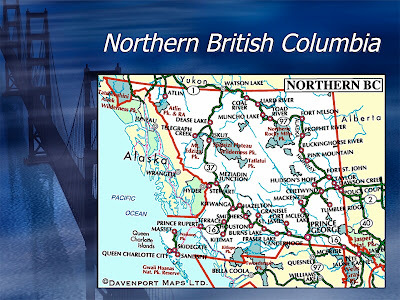 The Allied Tribes of BC, the first Province wide native organization, was formed to pursue land claims & secure treaties. 1920 BC Indian Land Settlement Act implemented the reduction of reserve land without consent of the indigenous people, contradicting the Federal Indian Act. Enfranchisement (giving up legal Indian status to become Canadians) was made compulsory whenever natives went to university, joined a profession, stayed over 5 years off-reserve, married a non-aboriginal, etc. This Laws were not repealed until 1952. 1928 BC aboriginal population dropped to less than 30,000, lowest since European contact. 1949 BC aboriginal population was granted provincial voting right. 1960 On reserve Indians were granted federal voting right. 1965 A Nanaimo native was arrested for hunting in unsettled portion of Nanaimo Treaty area. The Province argued that the Douglas agreements were not treaties. Supreme Court of Canada disagreed. 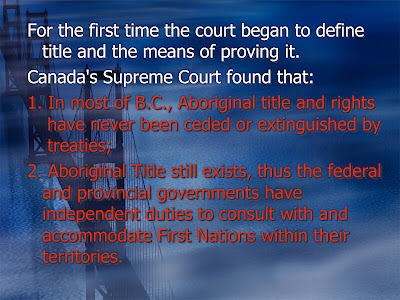 1973 Supreme Court of Canada overturned the lower court's decision on Calder v Attorney General of BC and recognized land rights based on aboriginal title. 1982 Repatriation of the Constitution: When the BNA (1867) was brought back to Canada from London, the totality of treaties, proclamations and other British laws governing the British relationship with the many sovereign aboriginal nations in British North America were incorporated into the Canadian Constitution. The incorporation was vital, as failure to do so will leave Britain exposed to disputes with native nations it had signed former treaties with. The Royal Proclamation, together with the many treaties now is part of our Constitution, the fundamental law of the land. 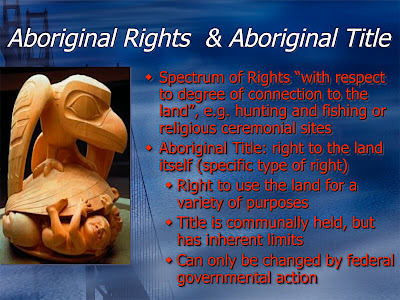 Furthermore, under pressure from the indigenous nations, Section 35 (1) was added to the Constitution to recognize and affirm the "existing" aboriginal and treaty rights of the aboriginal people in Canada. 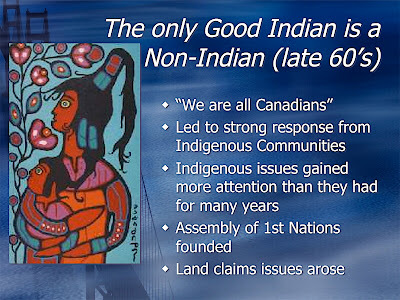 1985 The Indian Act was amended to remove the discriminatory sections inside due to intense pressure regarding human rights violations pointed out by United Nations to Canada in 1982. Slide 20: Area discussed in Glavin text is from Smithers to Hazelton and Kiwanga. 16 is Yellowhead Highway, 97 is Alcan Highway that links Canada and Alaska. 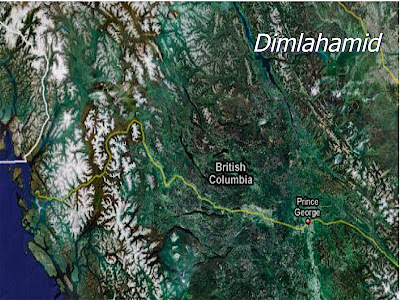 Slide 21: Map shows Yellowhead Highway between Prince George and Prince Rupert. Area discussed in text is around northernmost point on Yellowhead. Pale areas are clearcuts; darker green areas are still forested, but much of this area has been overcut. 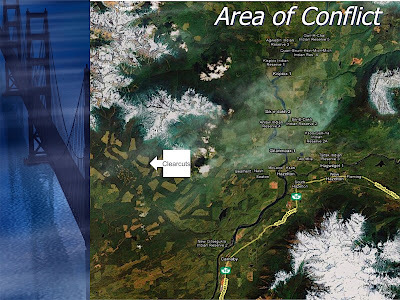 Slide 22: This close-up view of the Area of conflict shows numerous areas that have been heavily clearcut. Only a few areas on the slopes of higher mountains appear to have intact forest. Clearcutting along rivers and streams destroys spawning habitat for salmon. 1990 Native roadblock at Duffy Lake Road to oppose the encroachment of logging into Ure Creek, the area of sacred burial grounds as well as the imposition of illegal PCB storage. 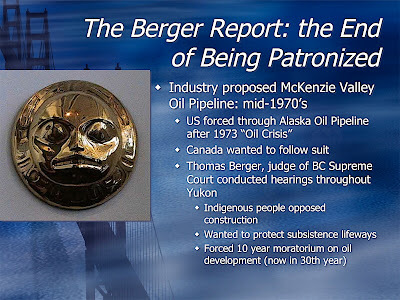 BC government abandoned its 119 year long policy of refusing to acknowledge aboriginal rights and title. In December it approved the establishment of a treaty negotiation task force. 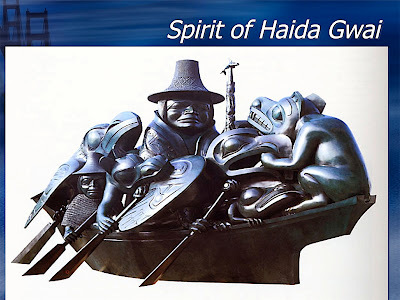 1995 Gustafsen Lake standoff: the largest peacetime mobilization of Canadian Armed Forces against a dozen or so natives celebrating Sundance on unceded territory. 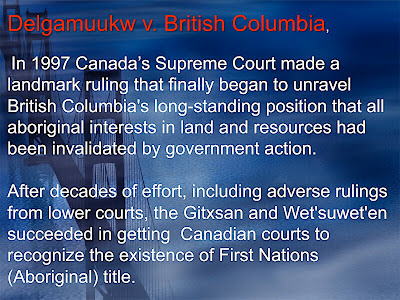 1997 Supreme Court of Canada handed down the historic Delgamuukw decision overturning all the former BC court decisions on the same case and affirming the native's oral history and their claim to land. 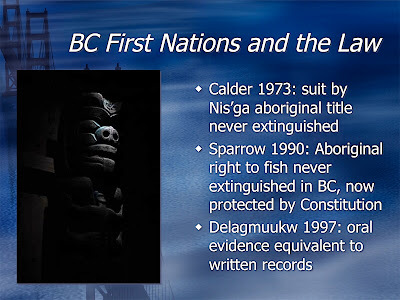 Slide 24: The Delgamukw ruling, which is the main theme of the Glavin Book is one of the most important6 rulings ever on Aboriginal Land rights, and establishes that oral traditions carry evidential weight equivalent to that of written records.